So I guess we're getting a Justice League movie? "First came "Man of Steel." Next up is "Batman vs. Superman." And then, "Justice League." Confirming the studio's plans for a movie based on its iconic super-team for the first time, Warner Bros. president of worldwide production Greg Silverman said the studio has set plans to make a "Justice League" movie. Like "Man of Steel" and its follow-up, which starts production next month, "Justice League" will be directed by Zack Snyder. Henry Cavill is expected to return as Superman, along with Ben Affleck and Gal Gadot, who play Batman and Wonder Woman, respectively, in 2016's "Man of Steel" sequel tentatively titled "Batman vs. Superman." "It will be a further expansion of this universe," said Mr. Silverman. "'Superman vs Batman' will lead into 'Justice League.'" A script is still in development and Warner has not set a release date, though the movie is unlikely to come out before 2018. Mr. Silverman would not comment on what other heroes might join Superman, Batman and Wonder Woman in the movie. However the studio has recently been casting the role of Cyborg, a half-robotic hero who is expected to have a cameo in "Batman vs. Superman" and then appear in "Justice League." 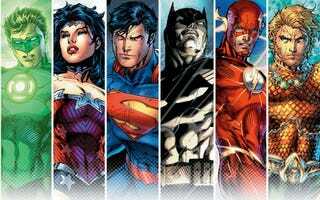 Other DC heroes who have been in Justice League comic books include Aquaman, Flash and Green Lantern." Oh, DC, look at you trying to catch up to Marvel Studios.